The true price of a banana varies depending on its origin. The total of external costs for Fairtrade Bananas is US$ 3.65, which is significantly lower than the sector benchmark. 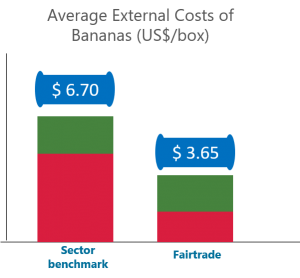 The total external costs of sector benchmark bananas is US$ 6.70. Description: True Price conducted a global study examining the externalities of banana production in four countries: Colombia, Dominican Republic, Ecuador and Peru. Using data collected from trusted local contacts, we measured and quantified social impacts including underpayment, harassment and job security to understand the most material social costs to this sector.